If you’re a fan of Steve Gadlin’s Star Makers, here are three awesome things you can do to support us! We post every episode and every clip on our YouTube channel. When you subscribe, you’ll be the first to know about new content. And getting that subscriber number up helps us reach more people around the world. If you’re a fan, clicking that subscribe button would mean the world to us. While you’re at it, don’t forget to check us out on Twitter and Instagram, too! Steve Gadlin’s Star Maker’s is a labor of love, and is supported in part by our viewers. Count yourself among our patrons by supporting us on Patreon.com. For as little as $1 per episode, you can enjoy perks like being listed in our credits, being mentioned on-air, or even joining us in studio for a taping. Come be a part of our show! Each episode of Steve Gadlin’s Star Makers is filled with talented people from our local community. Some even make the trip from neighboring states to share their talent with you! Do you have a talent you’d like to share? 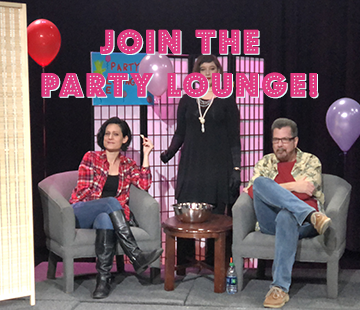 Or would you like to watch from the best seats in the Steve Gadlin’s Star Makers Party Lounge? Reach out and let us know. We can’t wait to meet you.